highlight your company’s logo and name. exude a custom and premium feel that elevates your brand. catch the attention of your clients and prospects. comes in gold, silver, copper, black, blue or red foil colors for more design options. With five foil print business card sizes to choose from, standing out will be easy peasy. So what exactly is foil stamp printing? Simply put, it’s a special process where heat and pressure is used to transfer metallic foil onto paper to create various shiny designs and graphics. Foil print business cards can do wonders to promote your brand and make you stand out in any scenario. All-Out Shine. This has a more prominent shine and higher reflectivity. It also features a more realistic metallic look compared to metallic ink prints. A Different Feel. It feels smooth to the touch like actual metal, which makes it great for embossing and debossing cards. Heavy-Duty Glow. Metallic print business cards are more durable and last longer. Uncoated Finish. The cardstock has no added coating or finish for a tactile feel and rustic look. This creates a higher contrast with metallic ink, so your foil design shows more prominently. Silk Laminate. The dull finish feels luxurious to the touch and imparts an elegant look and feel. The added film coating makes the cardstock water and tear-resistant. This is available for the 16 pt. C2S cardstock material. Spot UV. Add this gloss in addition to your foil accent for a brilliant shine. This coating picks up the light and adds more texture to your metallic print business cards. Highlight Your Edges. Round corners add a more fun, casual vibe for creative and unconventional uses. This edge prevents dents and snagging, so your foil print business cards last longer. Design note: When designing your card, make sure to leave a 1/16” gap between your foil and spot UV accents. Contrast. Make sure your foil design will be easily seen by picking a background that will let your foil color stand out. Font Size. Make sure the font you pick is easy to read, and should ideally be 8 pt. size or larger. Margins. 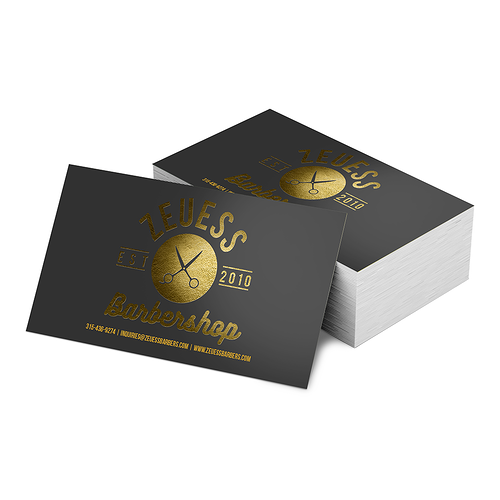 Business cards are printed on a large sheet, so there might be some slight variation when it is cut. To ensure your design will not be cut, set a ⅛” thick bleed margin on your card edges. Don’t put any text along the edge or borders that may look off center when cut. Learn how to elevate your business with foil business card printing. Here are some business card marketing tips to help you get started. Check out our business card templates for out layout guidelines. Can you print on both sides of foil business cards? Yes. You can have your design printed on the front or front and back for both 14 pt. uncoated and 16 pt. silk laminated cardstock. You can add more information when you use both sides of your business cards. What is printing turnaround? Is it different from delivery time? “Printing turnaround” is the number of days needed to process your order. This starts as soon as you upload a print-ready file to a paid order. The turnaround time does not include shipping time, weekends and holidays. To find out your delivery time, go to the online calculator. Click on “Estimate Delivery Date & Shipping Cost” under the “Upload Your Artwork” button. This will show the transit time based on your zip code. What do you mean by a “C2S” cardstock? “C2S” is the coating applied to the cardstock at the paper mill before it gets to the printer and prints on it. This is different from other coatings applied after the printing process such as varnishes, laminates, and matte, UV, or aqueous coatings.